10 most common mistakes in Social Media and how to correct them! 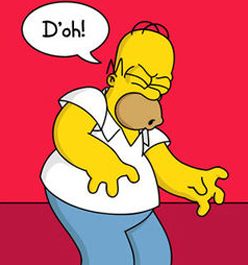 The 10 most common mistakes of companies in Social Media and how to correct them now! Social networks are excellent tools for your business to be successful but it can also turn out to be a rather frustrating task if you don’t know what you are doing. In today’s article, we will show you how you can stop making the most common mistakes in social networks so you can start to see incredible improvement in your business by acting on social networks. Start right this moment! It is very common and rather disappointing to access a brand’s fan page and fail to find any information about it. We don’t know what it is about, what’s its goal, where it is located, whether it has a website or not, among other things. Upload an attractive cover photo that reflects your brand’s personality including a description of your business. Upload a profile picture that allows people to identify your brand easily. Complete the information on your profile and add the link to your website, blog or contact page. Choose the right category of your business so it can be easily found. Use Facebook’s applications in order to take full advantage of your fanpage and make it more attractive. Definitely, this would mean a much bigger problem than simply reading the tedious terms and conditions. Be it a small or big action, such as contests and special offers, you must follow the rules. In order to update the cover photo and profile picture here’s the Link to Facebook so you can do it correctly, respecting the dimensions and other characteristics you should take into account so it’s “legal”. So what’s my point? You must give your brand a personality and make it speak as just another friend of your audience. Of course it’s not the same to talk to a group of architects than to a youngster who practices longboarding but being a brand that doesn’t target someone specific (me, audience) is similar to being in a conference where the lecturer speaks very low, with no rhythm and without making eye contact with the audience, zero interaction. The result? People fall asleep, they start drawing or chatting on their cell phone. Of course it’s not the same to talk to a group of architects than to a youngster who practices longboarding but being a brand that doesn’t target someone specific (me, audience) is similar to being in a conference where the lecturer speaks very low, with no rhythm and without making eye contact with the audience, zero interaction. The result? People fall asleep, they start drawing or chatting on their cell phone. People enjoy relating to people they can identify with and if you want them to speak about you need to start a conversation that will be interesting for both parties. You can apply this right now. Use the proper language, speak in second person, as if it was a one-on-one conversation while understanding who is your interlocutor and what he expects from you. This needs to include content that’s coherent with your brand’s personality and your business’ strategy. These two pages are quite different. They target a very specific audience therefore their way to address their audience and the articles they share are related to their tastes which, without fail, results in identification. It is paramount for a brand to define carefully its personality, establish an excellent communication with its fans and come up with specific and adequate content for its audience. It is a task that takes time and effort although, luckily, now are several tools that make it easier. Everything you do and everything you FAIL to do will be exposed to your audience and this has a strong impact. You don’t need to be looking for content and uploading it every single day, 8 hours a day. For many of you what we’re suggesting may not make a lot of sense but if you analyze what we have analyzed it really is a very logical point. Why do it? Firstly we need to consider that not all your fans are online at the same time, which is why if we only upload our post once it will only be seen by those online at that moment. People’s habits vary and we need to cover all possibilities. Another point: your post isn’t always shown in the news section of 100% of your fans. This part of the new algorithm is a tad complicated but what you need to know is that if you want everyone to see what you have to say uploading it only once is not going to cut it. We can take as an example two important news networks such as ESPN or CNN, which are constantly posting the same information within the same day so they can reach all of their audience. 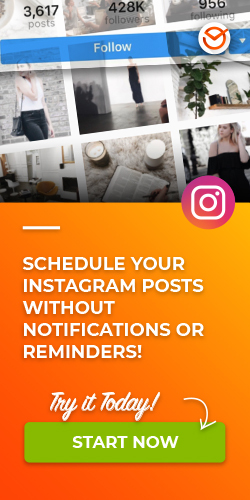 So we recommend you publish the same post several times, you could perform small changes in the title or change the picture in a way while maintaining the same content. 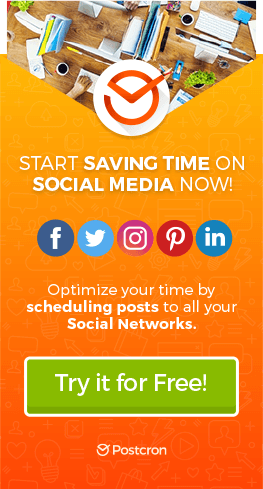 We suggest you use a tool to program posts in social networks such as Postcron to repeat the same post in different schedules and days. During the first week, post at least three times the same post, if possible with different titles; if the content can be reposted (for instance: guides, tutorials, etc) repost it at least once a month. This is an excellent way to take full advantage of your contents! 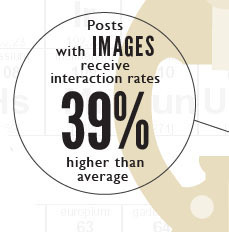 Photo posts account for 39% more interaction than any other post. 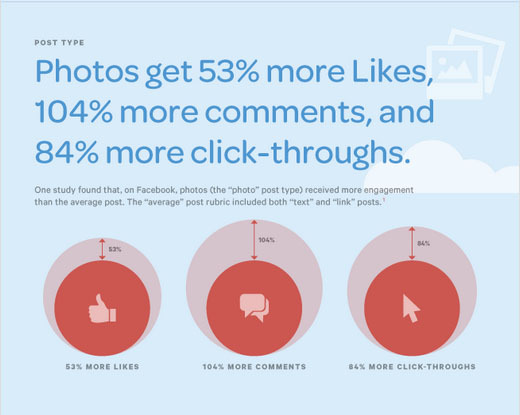 Photo posts get 104% more comments and 53% more likes. 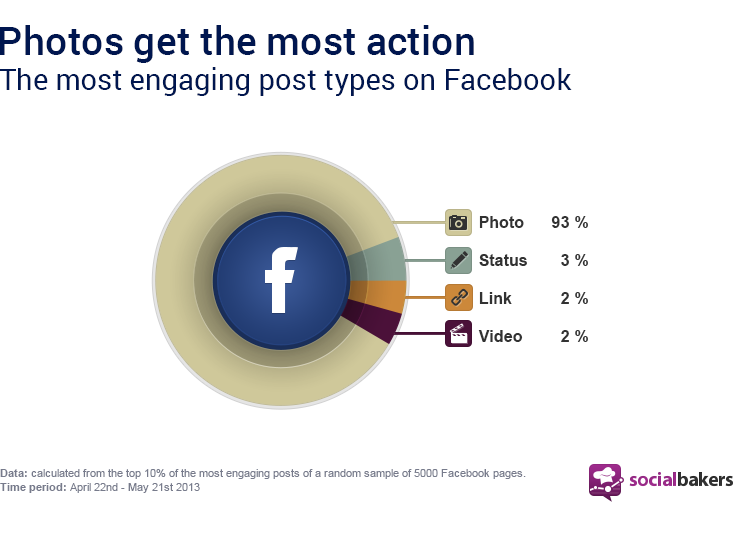 Photo posts get 93% more engagement. Text Posts with less than 250 characters get 66% more engagement. Don’t disregard these figures but remember social networks are social. You are building a friendship with your followers and you need to upload things that are useful for them, things that they are interested in beyond your product or service. There’s no question everything you do must contribute to your business but when it comes to social networks you must go beyond what involves your business. Even if you take a look at our Facebook you will find that several of our posts discuss happiness and freedom. We know our followers and we know most of them are entrepreneurs, and those lucky enough to be so, love freedom, seek to be happy and take chances in order to achieve that. That’s why we also post articles that inspire and help in every-day tasks. This point is closely related to the previous one because we discuss doing things so your audience will want to follow you. Besides having a brand with an attractive image and a consistent, coherent discourse that’s audience-oriented it is necessary to come up with actions that encourage your audience to visit your website because they feel they are getting something out of your brand, even if they are not getting any gifts. Provide information about your new products or the latest thing in the market and how YOU have that especially for them. Share with your fans information that can improve their quality of life or their work. Make your fans feel special. Answer promptly to their questions. They need to perceive you are reading them and that you are interested in their concerns. This makes a big difference and causes you to stand out among other brands. 7. YOU ARE ONLY INTERESTED IN SALES AND LIKES. We believe that, as well as the previous points, this is a very logical point but sometimes we forget to put ourselves in the user’s shoes, to think as a user and fan in order to rethink this and many other mistakes. Accessing a fanpage and realizing the only thing they publish are posts related to the brand, their products, the prices, the measurements, the payment methods, the different models, etc. is boring! This is necessary but it cannot be the ONLY thing you publish. For that purpose we have Ebay, Mercadolibre, Amazon and other online sales websites. Right? Accessing a fanpage and realizing the only thing they publish are posts related to the brand, their products, the prices, the measurements, the payment methods, the different models, etc. is boring! This is necessary but it cannot be the ONLY thing you publish. For that purpose, we have Ebay, Mercadolibre, Amazon and other online sales websites. Right? It’s not very pleasant to be around people that only talk about themselves and that don’t care about you, that can’t be bothered to ask about your life or your family. We tend to avoid people who are all about “me me me me”. Well, the same thing happens in social networks. Actually, in this case your fans come first and then your business. First you must create the space, the community, the trust, the loyalty and then comes the sale. We understand that it is your business and that you need money but when it comes to social networks you need a lot of patience. In order to avoid coming across as a desperate salesperson complete your fanpage with posts related to the habits and lifestyle of your users and what they consume besides your brand. You must pamper your audience, listen to them, ask them their opinion. It is your job to establish the basis of a friendship so that, later on, the rest of your marketing and company’s objectives are accomplished. This point is essential to reinforce the relationship with your fans. If someone went through the trouble of writing an enquiry or a complaint about something, please answer. We can’t emphasize enough the importance of both positive feedback and negative feedback. You will learn so much from it in order to improve the quality of your products or services and you will also make your followers feel you are genuinely interested in them. All of this scores points for your brand’s image. When starting this trip in social networks many people want to be part of all of them. They create a Youtube channel, a profile on Twitter, Facebook, Linkedin, Pinterest, Vine, etc, etc, etc. But honestly it will do you no good if you cannot sustain it throughout time. We suggest you start with one, maybe two, and once you are an expert handling them then you can widen your scope to other social networks. The same thing as in the previous point applies here. Try to learn and understand some metrics, those you think are truly important for your website to take off and become established. 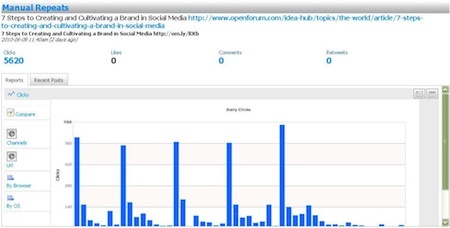 In case you are taking your first steps in social networks we leave you two Facebook links for you to learn more about metrics and statistics you can access to. Information and guide to program reports. Upload an attractive cover photo and profile picture that represent your brand. Complete all the information fields in your profile. Don’t jeopardize your page and business. Read the terms and conditions before performing any action. Define a personality and discourse for your brand. Humanize it and remember social networks are social. Share content on a daily basis. Share the same post several times even in the same day at different times. You will get more visibility and you won’t lose traffic. Remember your content needs to follow the latest trends: using pictures and writing short text, in order to get more likes, shares and engagement. Everything’s related to your audience. Don’t forget that detail. Cover a need. Offer your followers incentives even if this doesn’t imply giving away something. Don’t avoid criticism. You must always answer your followers, whether they are enquiries, good feedback or criticisms. Remember sales or your business’ success will depend on or be a consequence of having created and secured the relationship with your community. You must build a relationship with your followers. You will accomplish the rest of your objectives once you can secure your place in social networks. Remember it’s better to specialize in one or two social networks rather than in several which will be neglected. 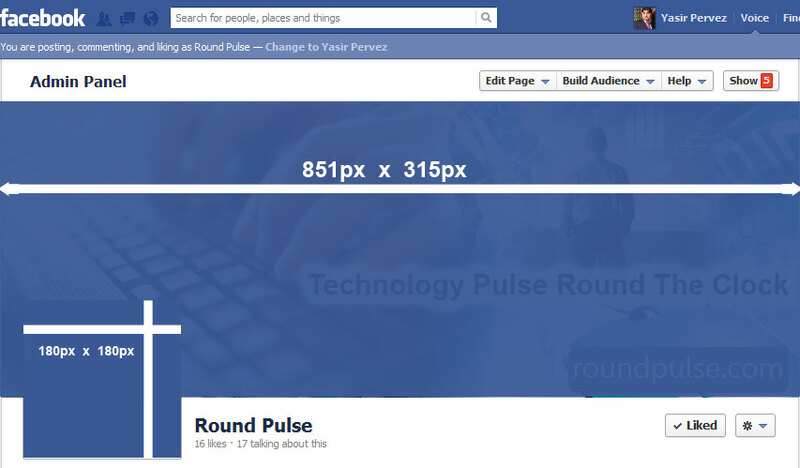 Start with Facebook and use a tool to program your posts in order to make your job easier. Choose only some metrics to control. Get to know them and work on those ones before moving on to others. What other mistakes do you think are most common? Share your opinion with us!